NAMED ONE OF THE BEST BOOKS OF THE YEAR BY BUZZFEED • A companion novel inspired by Star Wars: Battlefront, this action-packed adventure follows a squad of soldiers caught in the trenches of the ultimate galactic war between good and evil. The bravest soldiers. The toughest warriors. The ultimate survivors. Among the stars and across the vast expanses of space, the Galactic Civil War rages. On the battlefields of multiple worlds in the Mid Rim, legions of ruthless stormtroopers—bent on crushing resistance to the Empire wherever it arises—are waging close and brutal combat against an armada of freedom fighters. In the streets and alleys of ravaged cities, the front-line forces of the Rebel Alliance are taking the fight to the enemy, pushing deeper into Imperial territory and grappling with the savage flesh-and-blood realities of war on the ground. Leading the charge are the soldiers—men and women, human and nonhuman—of the Sixty-First Mobile Infantry, better known as Twilight Company. Hard-bitten, war-weary, and ferociously loyal to one another, the members of this renegade outfit doggedly survive where others perish, and defiance is their most powerful weapon against the deadliest odds. When orders come down for the rebels to fall back in the face of superior opposition numbers and firepower, Twilight reluctantly complies. Then an unlikely ally radically changes the strategic equation—and gives the Alliance’s hardest-fighting warriors a crucial chance to turn retreat into resurgence. 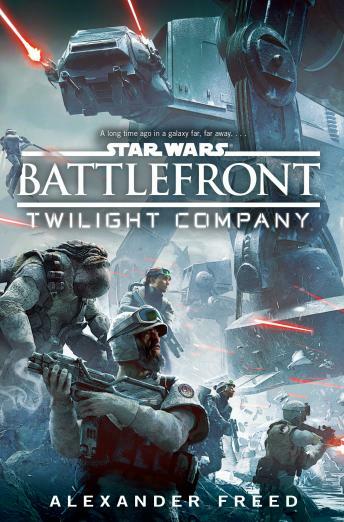 Orders or not, alone and outgunned but unbowed, Twilight Company locks, loads, and prepares to make its boldest maneuver—trading down-and-dirty battle in the trenches for a game-changing strike at the ultimate target: the very heart of the Empire’s military machine. Awesome book and narrator! I enjoyed every minute of the story. It makes you feel like you're there in the batttle. The book was quite good. It starts off a little jumbled, but it really ramps up and the final act was intense! It was definitely it's own special kind of story in the star wars universe and not quite as lighthearted and adventurous. It was definitely very centered on the war, and the soldiers and people being affected. The narrator also did a great job, and gave each character their own unique voice. It's hard for male readers to do convincing female characters sometimes, but Mr Davis had no trouble at all!